Can an AI perfect your LinkedIn profile picture? In your professional life, first impressions are vital. For many people, LinkedIn is where the majority of working relationships are born. Given that profile pictures are often the first thing a potential employer or recruiter will see, isn’t it important that they’re the best they can be? Enter Snappr’s Photo Analyzer. 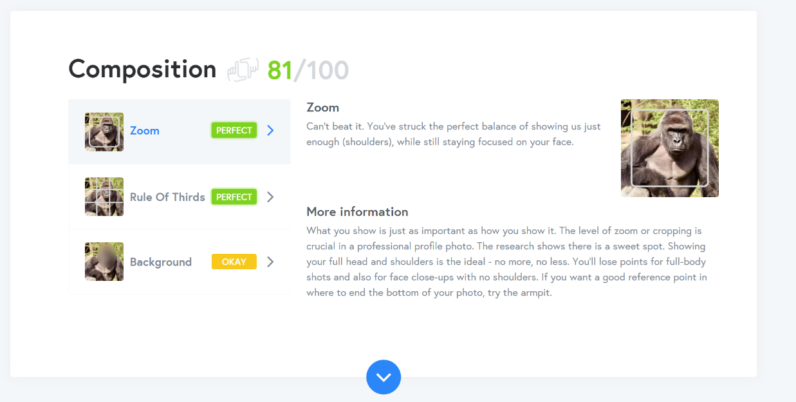 This AI script inspects your LinkedIn profile picture, and using a set of criteria, determines how good it really is. So, here’s mine. It’s an old photo, and therefore not really an accurate reflection of what I look like now. I was 22 when that was taken. Since then, I’ve put on a few pounds and grown an unkempt beard that makes me look a bit like Rasputin on doughnuts. This effort won me a score of 68. Not bad, but not great either. The site told me I need to smile more, stop squinching my eyes, and improve my posture, so that my picture meets the ‘rule of thirds’. Other members of the 68 club include TNW alumni Juan Buis, and Product Hunt founder and CEO Ryan Hoover. I’m in good company. As a basic guide, Snappr’s Photo Analyzer does a decent job. It can show you if it meets the essential guidelines of composition. What’s more, it does this consistently. Take this photo of Nigel Farage’s gurning, nightmarish face. This got a score of 71. Respectable. One of the points of feedback from the app is that Nigel desperately needs to shut his mouth – a sentiment many of us in the UK have been echoing for some time. Except this time, it’s because not enough of his jawline shadow is visible. Another point of contention raised by the site is that the background is too dark, and that there’s not enough contrast. Just trailing Farage is actor Nick Nolte, with a score of 70. One of the key criticisms of this piece is that he’s not smiling. Possibly because it’s his prison mugshot. So, how does Snappr Photo Analyzer work with non-human subjects? I tested it out with former resident of the Cincinnati Zoo, Western lowland gorilla Harambe. Harambe scored 70. In terms of composition, this picture was perfectly lined up. His jawline was also rated ‘perfect’. Areas for improvement include the fact that he’s not smiling, and his eyes are sufficiently ‘squinched’. While Photo Analyzer does a sterling job of giving general advice about how to compose a photo. It’s convinced me that now’s the time to update my LinkedIn photo. Although, it could be said that the biggest cue to update your LinkedIn photo is when Harambe and Nick Nolte’s infamous mugshot are rated higher than you.